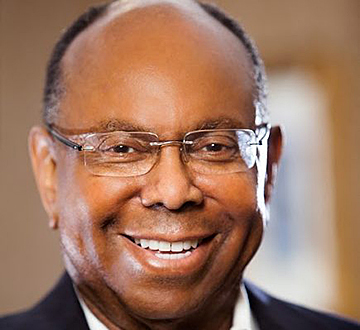 Dr. William F. Pickard will share his story of being the first person in his family to graduate from college and working to become one of the top businessmen in the country when he visits The University of Toledo for Black History Month. He will speak Tuesday, Feb. 26, at 7 p.m. in Doermann Theatre. Pickard is chair of Global Automotive Alliance, a co-managing partner of MGM Grand Detroit Casino, CEO of Bearwood Management Co., and co-owner of five newspapers. Pickard’s career started with a McDonald’s franchise in Detroit. In 1989, he founded an automotive manufacturing company, which became Global Automotive Alliance. The holding company for some half dozen businesses has about 1,600 workers and approximately $500 million in sales. One of the nation’s leading minority-owned companies, Global Automotive Alliance supplies plastic parts to the top three automakers in the United States. The entrepreneur and philanthropist shares his leadership skills on the board of the National Urban League and as a member of the Detroit branch of the National Association for the Advancement of Colored People. In 1982, President Ronald Reagan appointed Pickard to be the first chair of the African Development Foundation, and President George Bush tapped him to serve on the National Advisory Committee on Trade Policy Negotiations in 1990. Pickard received a bachelor’s degree from Western Michigan University, a master’s degree from the University of Michigan, and a doctorate from Ohio State University. • Tuesday, Feb. 5 — Black Student Union Comedy Show, 7 p.m., Thompson Student Union Ingman Room. — A UT student leader will be honored with the Black Excellence Award during halftime of the men’s basketball game against Akron at 7 p.m. in Savage Arena. In addition, African-American students will be highlighted during the game. For tickets, go to the Toledo Rockets website, call 419.530.GOLD (4653), or stop by the UT Athletic Ticket Office in Savage Arena. UT employees and retirees may purchase tickets at half-price; UT students are admitted free with ID. • Wednesday, Feb. 6 — Jerome Jenkins, former basketball coach at California State University at Sacramento, will give a talk, “The War Within,” at 6:30 p.m. in Thompson Student Union Room 2592. • Thursday, Feb. 7 — Black History Month Film Series: “Moonlight,” 7:30 p.m., Center for Performing Arts Room 1039. • Monday, Feb. 11 — Step Afrika! will perform at 7 p.m. in the Thompson Student Union Auditorium. The dance company dedicated to the African-American tradition of stepping tours around the globe. • Thursday, Feb. 14 — Black History Month Film Series: “Creed,” 7:30 p.m., Center for Performing Arts Room 1039. • Friday, Feb. 15 — Dr. Derek Alderman, professor of geography at the University of Tennessee, will give a talk titled “The Maps Behind the Movement: African-American Freedom Struggles as Geographical Work” at 2:30 p.m. in Snyder Memorial Building Room 2110. • Thursday, Feb. 21 — Black History Month Film Series: “Pariah,” 7:30 p.m., Center for Performing Arts Room 1039. • Friday, Feb. 22 — Black Student Union Fashion Show, 6 p.m., Thompson Student Union Auditorium. Ticket prices to be announced. • Monday, Feb. 25 — “Black GirlZ Rock,” 6 p.m., Thompson Student Union Ingman Room. The National Pan-Hellenic Council will honor women on campus who have made an impact on UT students. • Thursday, Feb. 28 — Black History Month Film Series: “Get Out,” 7:30 p.m., Center for Performing Arts Room 1039. 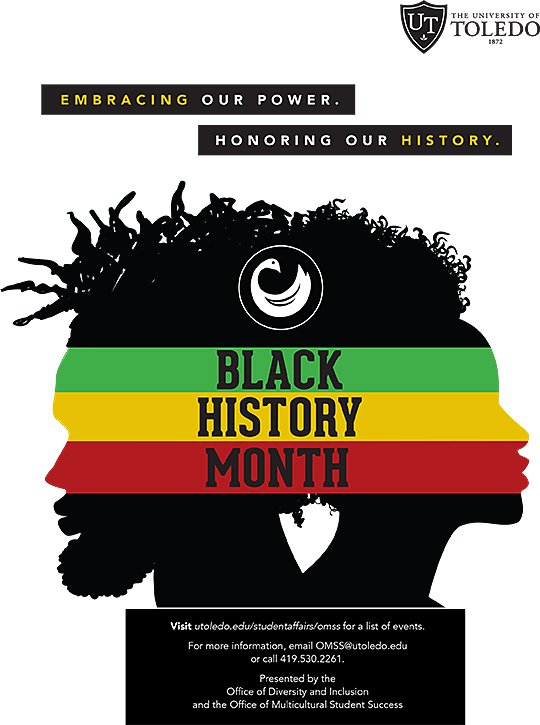 For more information on UT’s events for Black History Month, contact Young at david.young@utoledo.edu or 419.530.3815. This entry was posted on Thursday, January 31st, 2019 at 3:49 am and is filed under Events, News, UToday .